There are no rules for how to choose a photo that will be effective as a biographical writing prompt, but we can offer a few guidelines for the types of images that often elicit storytelling that is deeper and more meaningful than a mere identifying caption. That’s the goal, after all: To use a photo as a starting point for your storytelling—as a jumping off point for memories, a touchstone for emotions, a lead-in to a narrative from your life. Step One: Choose 10-20 pictures to start with. Begin randomly looking at photos. Rather than focusing on those that are frame-worthy, look for photos that elicit a strong feeling from the viewer (you, or the family member from whom you would like to capture stories). Set aside 10-20 images that stopped you in your tracks in number two (even if you stopped to wonder about the image as opposed to reliving memories as a result of looking at it; sometimes it’s the mysteries behind a photo that draw forth particularly revelatory stories). Now it’s time to choose a photo with which to begin your reminiscing. Whether you are using the photo as a writing prompt or as a vehicle to jump-start conversation in a personal history interview, the following suggestions will be helpful in selecting images that lead to substantial storytelling. Ask yourself if the photo you are holding does any of the following six things—and if the answer to one or more of them is yes, then you’ve got yourself a winner. Set it aside and make sure it’s on hand the next time you want to delve into some family history writing! The photo invokes an emotional response. Do you feel a rush of excitement or a flush of scarlet creep up your face when you first spy the picture? It may make you feel anguish or sorrow, pride or exasperation, abundant joy or abiding love—the key is, it makes you feel. If a family photo has such a visceral effect on you, this will be most fruitful for writing its story. That photo that moves you is a doorway to your past that is clearly connected to your present in some way. Explore why you feel the way you do, and how this feeling fits into your life then and now. Provide context for your feelings; set the scene. The picture tells a visual story. Sometimes a picture itself already reveals a story: If the who, what, where, when, and why (or most of those) are apparent just from looking at the photo, then it’s likely a good candidate for embellishing upon. Of course, it’s ideal to choose images whose stories matter to you in some way. A photo is a moment in time, but on the periphery are details that help make up its narrative. What photo would have been shot just before this one? Just after? What’s in the frame? What (and notably who) is not in the frame? By starting with a picture whose story seems readily available, we can develop depth by asking such probing questions and tapping our memories for more. Your facial expression at the time the picture was snapped. The pattern of your grandmother’s well-worn house dress. A missing button on your dad’s shirt, or the papers falling from his briefcase. The water stain on the bedroom wallpaper. If some detail in a photo draws your eye again and again, there is more to be probed. What does the detail begin to tell you? What beyond the frame of the photo—on that day, or a decade before or after the photo was taken—makes you focus on it? By taking the time to meditate upon all that the detail calls forth in your mind, you will reveal a greater meaning to this photo than could ever be revealed upon initial inspection. The photo portrays part of the subject’s everyday world. My favorite type of modern family pictures could be described as documentary family photography: people in their natural environment, doing what they do every day. (Check out talented photographer Jen Grima’s work for inspiration.) I love capturing our routine family narrative this way because the resulting photos are so evocative of time and place, and they set us in scenes that are real and personal, uniquely ours. Many old family photos do so less consciously, perhaps, but the impact is the same. We are drawn to such pictures because they reveal what our or our ancestor’s life was like back then. So if a snapshot of your aunt holding you while she’s hanging the laundry crosses your path, use it to tell a story. 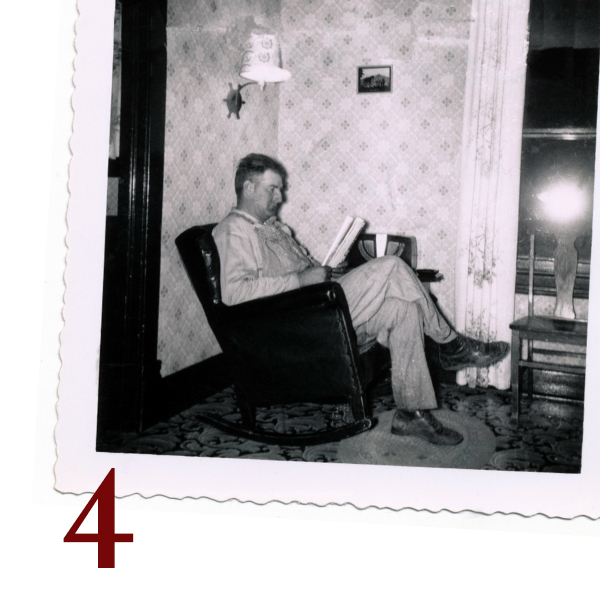 If you find a picture of grandpa reading in his favorite recliner, dad trimming the hedges at your childhood home, or your baby crawling amidst the messy remnants of Christmas wrapping paper, use them all—find their stories. Is it a curious shot? Out of the ordinary for your family or for the time period? Is someone missing who you would have expected to be present in that scene? If it makes you wonder, then it very well may lead to a worthwhile story. Perhaps you end up asking for relatives’ input to get to the bottom of your intrigue, or maybe in lieu of concrete answers you surmise the story behind the old photo, thereby revealing a narrative of your own in relation to the photo. Chances are, whatever your approach the resulting observations will be as alluring to the next person as the original photograph was to you. The physical print tells its own story. My grandmother had a tendency to hold a grudge, so it was not too surprising to find among her things photos that had an individual literally cut out of the scene (or crossed out with ballpoint pen). Now there’s a story to be revealed! The same could be said for pictures that have been torn, damaged by flood or fire, or found tucked away in a book. Sometimes getting to the story behind the photo is as fun—and constructive—as getting to the story that resides within it. Step 3: Start sharing your stories. 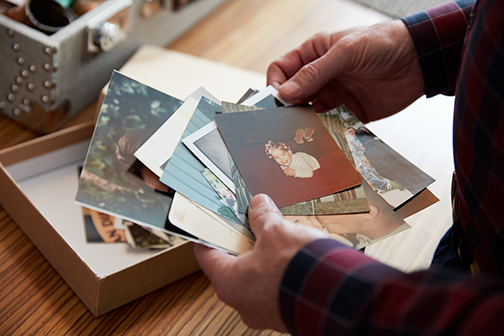 Read more about how to use old family photos as biographical writing prompts—we’re talking nitty-gritty advice, from where to begin after looking at the photo to how to capture your memories. Explore more intense self-reflective writing prompts in Beth Kephart’s memoir writing workbook. Once you’ve written your first life story vignette, consider doing something special with it—we’ve got five easy ideas.